En Route To G20, Trump Is Stopping In Poland For A Coal Lovefest. He'll Need It. If the so-called #TrumpTrain is a steam locomotive headed down a rusty, dead-end track, the president’s July 6-7 visit to coal-loving Poland is a logical next stop on the President’s overseas travel schedule. Poland could be a model for Trump’s vision of a fossil fuel state, where climate concerns and public dissent are limited. Coal generates 80% of Poland’s power, compared to 30% in the U.S., and is still used to heat 30-40% of Polish homes. The country’s authoritarian regime has cracked down the media and neutralized the independent judiciary by appointing hand-picked judges — all items on Trump’s domestic wish list. The timing of Poland visit, just ahead of the G20 meeting in Germany, suggests Trump wants to make a point about coal to the rest of the world, but it’s not clear how that will go over, since the rest of the world sees the U.S. and Poland as extreme outliers. German Chancellor Angela Merkel, this year’s G20 host, has already said she plans to make climate policy a focal point of the talks, and leaders of most of the world’s economic powerhouse countries are likely to once again harangue Trump for his rejection of the Paris climate agreement, as they did during the G7 summit in late May, when the U.S. was the only country that didn’t sign a joint statement of support for the Paris agreement. The G20 agenda also includes several other items that are of little interest to the president, including global 2030 sustainable development goals and gender equity. Trump won’t face those types of questions in Warsaw, where coal is still king. And he may also feel at home because Poland’s hard-right political swerve was driven by similar demographics as his upset win last November, including a political base in depressed rural and industrial regions, where the populist demagogues are able to exploit resentment felt by people who are unsure of their own fate in a shape-shifting world. Economic woes, xenophobia and fundamentalist religion are the ingredients for Poland’s right-wing nationalism, and just like Donald Trump, Law and Justice Party leader Jarosław Kaczyński is stirring the pot as he leads his country farther from European consensus. The government’s anti-democratic moves spurred a formal censure by the European Union, says Aleks Szczerbiak, a political science researcher at the University of Sussex (UK). “Poland has taken itself outside the European mainstream on environment and energy policy,” he says. Europe’s coal use has dropped 47% since 1990. 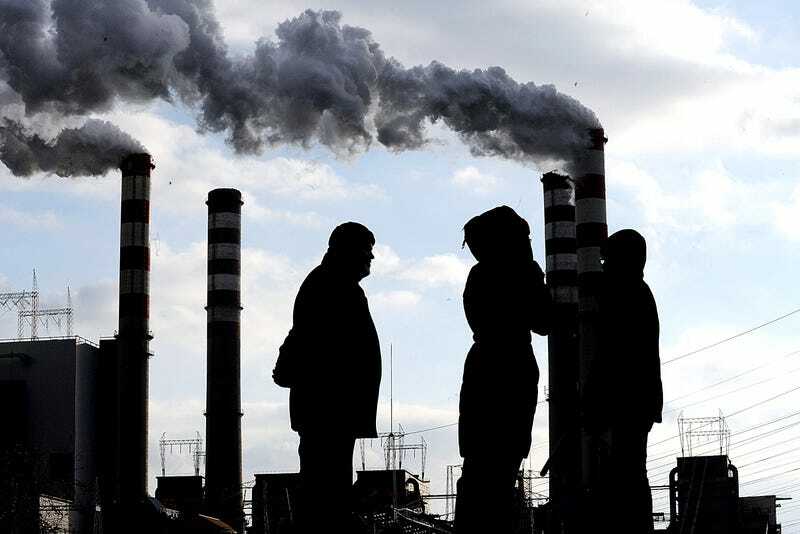 But in Poland, consumption has been steady the last 20 years, making it one of Europe’s biggest carbon hogs, with no clear plans for the type of energy transition needed to achieve the global target of capping the global temperature increase at less than 2 degrees Celsius. By contrast, U.S. coal production and coal use peaked a decade ago and is dropping steeply — 9% in 2016 — because of cheap and abundant natural gas and the surge of renewable energy technology. The Polish government has fought hard for coal and at one point even tried to blackmail the Paris climate talks to gain concessions for its own coal mining, industry and power sectors, according to Susanne Dröge, a policy analyst at the German Institute for Security and International Affairs, a Berlin-based think tank. “Now they want to bring down their commitments, they would really like to water down what they signed up for,” says Dröge, adding that the Polish government played one of its cards when it decided to host COP24, the 2018 version of the annual global climate jamboree, in Katowice, in the heart of Polish coal country. Trump could use his upcoming visit to Poland to drive an already existing coal wedge deeper into the heart of European Union, which he has accused of unfair trade — the president has made no secret of his disdain for the European project, cheering on Brexit and congratulating nationalist Hungary on adoption of a dictatorial referendum. Polish policy experts said liquid natural gas will also be a key topic. U.S. producers are eager to sell cheap gas, which would make Poland less dependent on its big eastern neighbor and a steady supply might prevent construction of new coal power plants. On climate and energy policies, Poland and Trump’s U.S. are natural allies, she says. The Turów coal mine, a large open pit mine in the southwest of Poland. Credit: Wikimedia Commons. The split was evident mid-June at a high-level European ministers council. The session featured a string of denunciations, but Polish Environment Minister Jan Szyszko took a conciliatory tone, saying he was surprised by European concerns about U.S. policy. “Trump had a certain election agenda and must carry through with it, otherwise he would lose credibility,” Szyszko said. “The USA has great achievements in limiting CO2 and leads in CO2 capturing technology. Cities and businesses are attached … there are other reasons not to worry too much the next four years,” he said, referring to the Paris agreement timetable that would make Trump’s pullout effective the day after the 2020 U.S. presidential election. Looking broadly, there are, with some exceptions, connections between the rising tide of nationalist, nativist parties in parts of the world, says Dan Keleman, a Rutgers University political scientist specializing in Europe. Germany’s version, the small but vocal Alternative für Deutschland (AfD), for example, is explicitly anti-EU, and fundamentally questions the basis for global climate action. The AfD is also strongest in rural and urban left-behind areas. “One is, climate change is a global problem which by its very nature requires international cooperation to try and address and solve it. That’s a problem for the narrative that everything can be solved at the national level,” Keleman says. The nationalist, nativist worldview includes a rejection of expertise, a rejection of “being lectured by the scientific consensus,” he says. That said, there is no outright denial of climate science in Poland, and there is broad public consensus that global warming is a problem that deserves attention. But according to polls, people in Poland are not as concerned about direct impacts as are people in many other countries. Like Trump, Polish nationalists see deals like the Paris agreement as infringing on sovereign choices, making them natural allies for Trump. “And if you want to look at the political economy of it, it’s a threat to fossil fuel industries. It also involves making energy more expensive,” he says, which makes it harder for the government to distribute state favors — like low energy prices — that keep core voters and coal companies happy. “For some countries, fossil fuel industries support a lot of voters that support conservative parties. I wouldn’t be surprised to see him trying to divide Europe on this issue. Trump is probably happy to have a country within the EU that’s skeptical of Paris,” he says. “He sees these rightwing populist governments in places like Poland and Hungary as ideological allies. He sees liberal democracy as a threat,” he says of Trump’s affinity for authoritarian leaders. On the receiving end of a lot of EU money, Poland doesn’t hold the best cards at European climate poker game, but having the U.S. as an ideological ally could bolster Poland’s efforts to weaken and undermine European ambition on climate policy, he says. Or, buddying up to Trump could spur even greater resolve among other EU nations, which have already rejected suggestions that the Paris agreement be renegotiated, says Aleksander Sniegocki, energy and climate analyst for WiseEuropa, a Warsaw economic think tank. “It could make it tougher for Poland, because the other countries want to move ahead with climate action in reaction to Trump,” he says. Changes in Poland’s energy policy won’t be driven by anything the U.S. president does or says. More important are the EU purse strings. And the same market forces that are killing coal in the U.S. will take hold, a few years later.